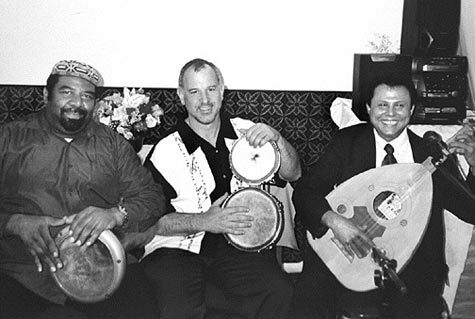 On the left is Yitzhak Levy-Awami on Doumbek, center is Isaac Gutwilik on Bongos. Notice the way they are held in the Yemeni style of music. Leader on Vocals and Oud is Ahmed Alrodini. We play some exciting rhythms from Yemen in 11, 7/8, 6/8 and also in layered waltz time. Yemeni music also has an ancient stick drumming tradition on kettledrums (marfaa and mishkal) that are an old version of our modern timbales. This shot is from a performance in NYC.